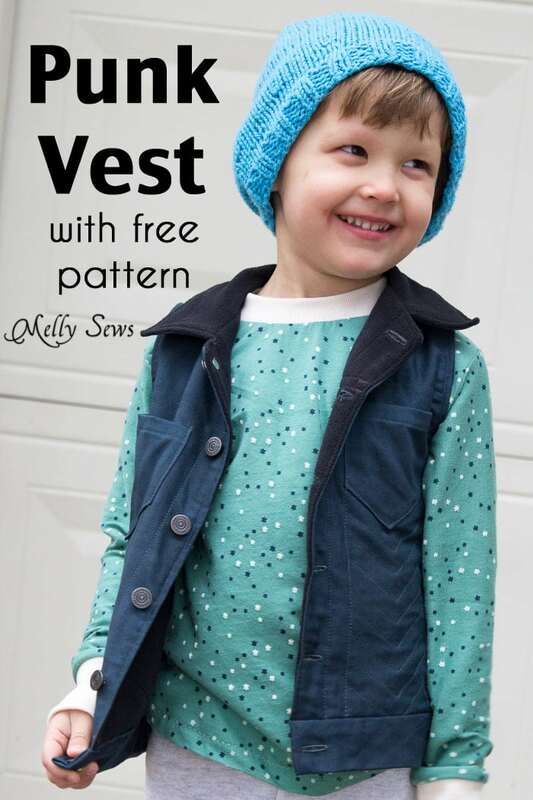 Hey y’all – another free pattern for Sewing for Boys month – the Punk Vest! 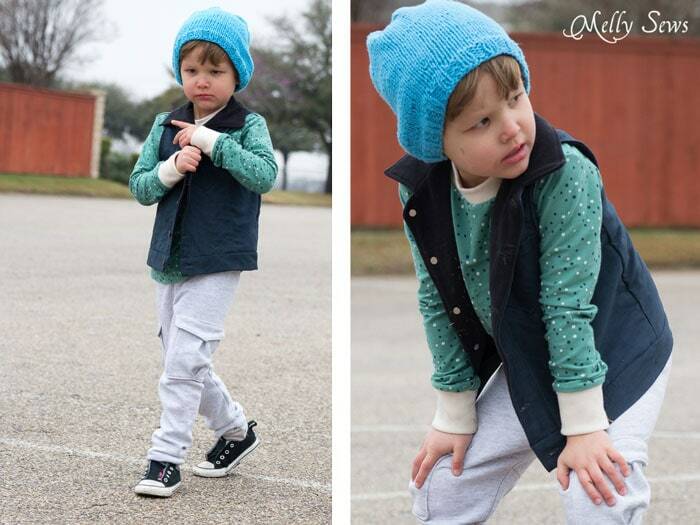 This is a boys vest pattern so named because of Bean. I looked through my stash and found black microfleece and gray twill. I knew the twill was too light, so I dyed it with black dye, but since I wanted a faded black I didn’t use the recommended amount of dye. The color turned out almost exactly like I pictured. 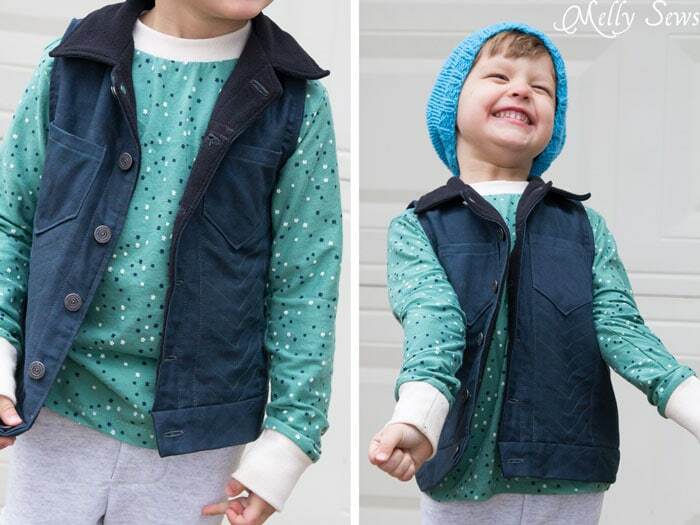 So I sewed up this vest for Bean, complete with jean buttons. So I went back to the drawing board and thought about the problem. Bean had said, “That’s not the one I asked for!” And the lightbulb went off. Yes, I pulled open the Pinterest image and saw that the inspiration jacket was a little more faded. So I quickly photoshopped it darker and showed it to Bean. “See, I made you a different one and now it matches!” I said, holding up the same vest I had already sewn. And he put it on happily. Sneaky mom for the win. And that is the story of why this is called the Punk Vest – both for his punk like behavior and the punking I had to pull to get him to wear it. The pocket pattern. Get that here. 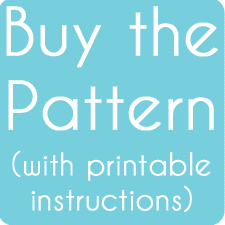 Print the pattern and cut the pieces as indicated on the pattern. (Need help with printing? 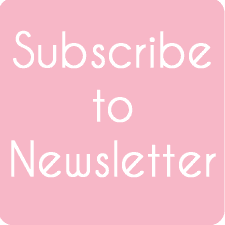 See this post). Start by pressing the top pocket edges about 1/4″ to the wrong side (left). 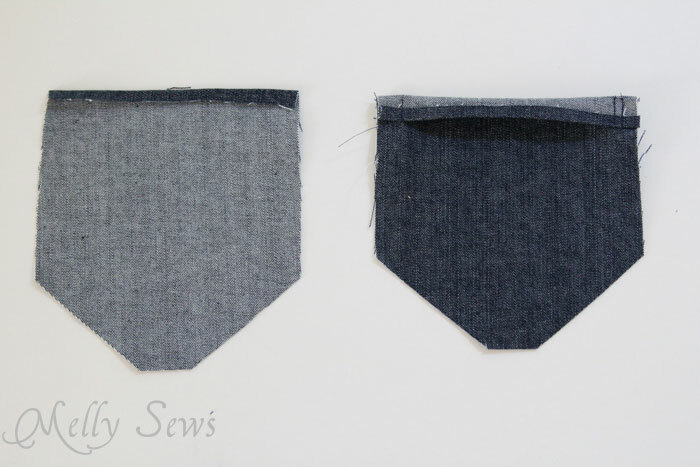 Then fold that 1/2″ to the right side and sew it down, 1/2″ from each side edge. (Note: I almost never finish the other raw edges of my pockets. They just don’t ravel enough in a pocket that’s mostly for decor and will soon be outgrown to bother. But if you wanted to have them finished, do that before this step). Turn the top of the pocket to the wrong side, pressing out corners. 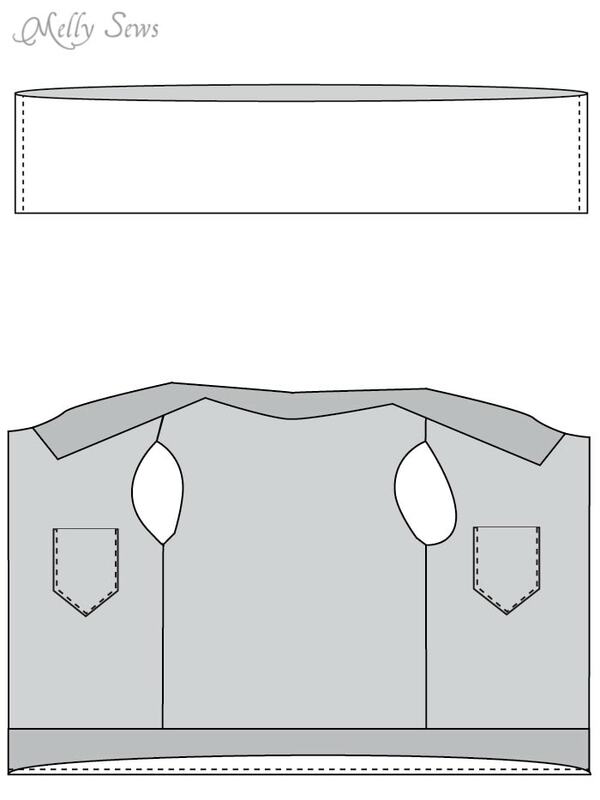 Fold under sides of pocket, press. Fold up bottom edges of pocket and press. Topstitch top edge of pocket so the hem stays in place. Sew the vest fronts to the vest back at the shoulder seams. Repeat with vest lining. 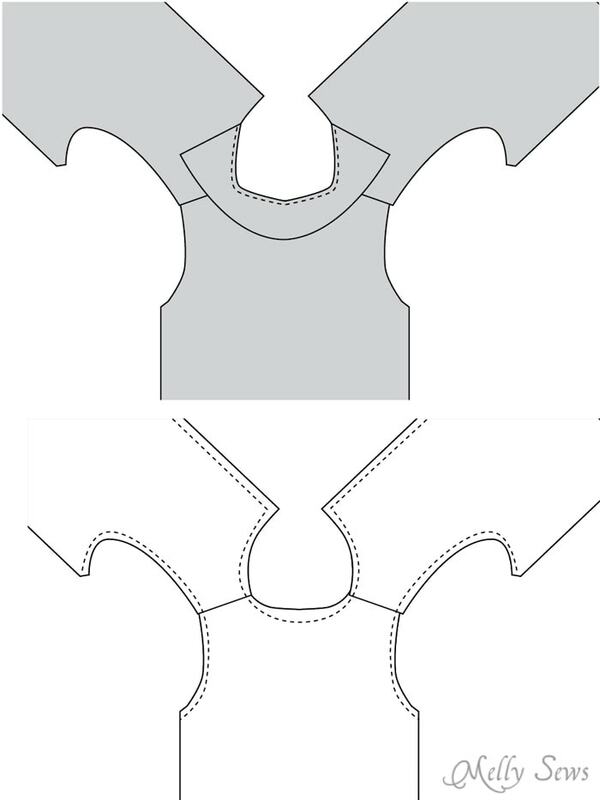 Place the collar pieces right sides together, and stitch around as shown above. Clip the corners, turn the collar and press. Place the collar along the neckline of the outer vest, matching the collar center and the center back neck. If you want the fleece side to show on the outside of the vest, place the collar with the fleece side up. Baste the collar in place. 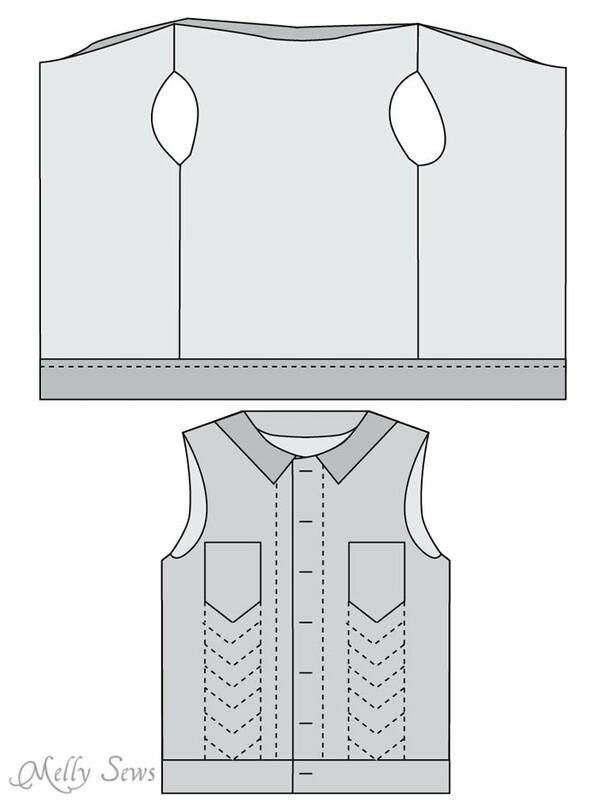 Place the lining and the vest right sides together, with the collar sandwiched in between. Stitch around the neckline and armholes as shown above. Clip curves and turn the vest right sides out. Pin the vest front to the vest back along the side seams, right sides together, pinning only the main fabric. Pin the lining front to the lining back along the side seams, lining right sides together, and matching the armhole seam. It will look like the picture below, and you’ll be able to stitch the outer and lining side seam on one side in one seam. Repeat on the other side. 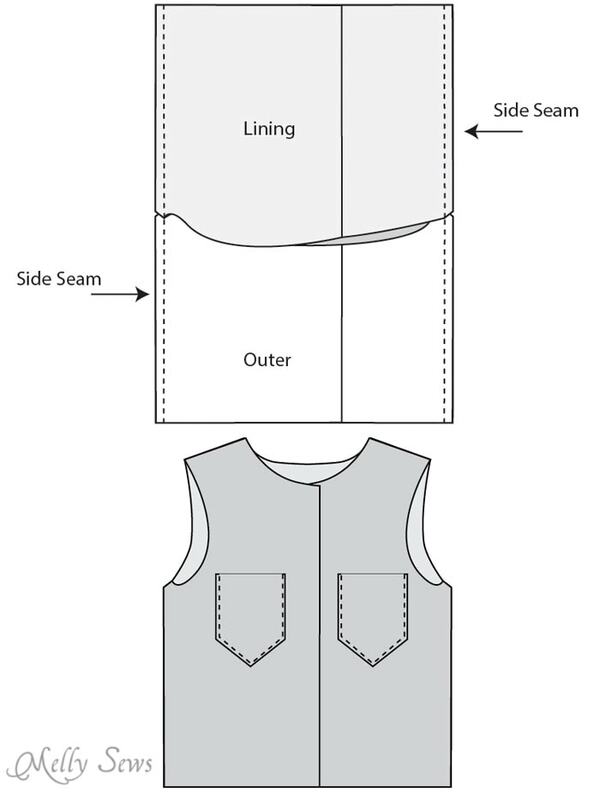 When you turn this right side out, all your side seam raw edges will be inside the vest, between the outer and lining fabric. 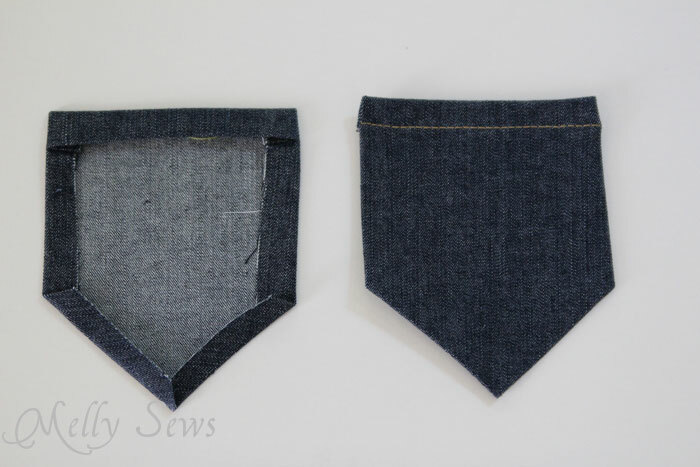 Fold the waistband right sides together, matching the long edges. 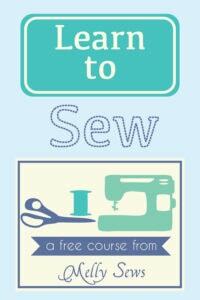 Sew across the short ends. Turn the waistband right side out and press. Place the waistband against the vest and pin one edge to the bottom of the vest, pinning to both the outer and lining fabric. Stitch through all 3 layers. Turn the waistband to the inside. 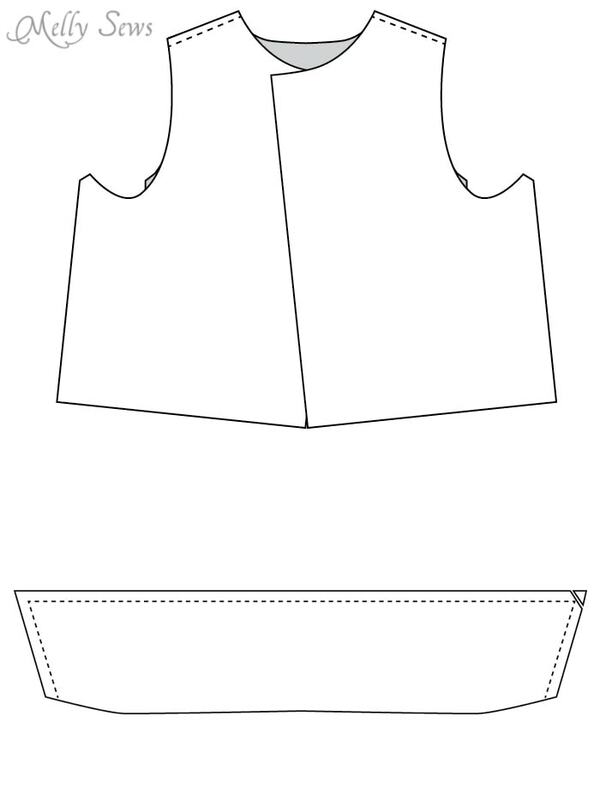 Fold the raw edge in 3/8 and make sure the folded edge covers the seam from the previous step. Pin. On the front side of the vest, stitch in the ditch to secure the waistband in place with all the raw edges inside. (Don’t know how to stitch in the ditch? See this video on Facebook). Mark the buttonholes and stitch them on the left side of the vest, then hammer on the jeans buttons according to the package directions on the right side of the vest. If desired, add some decorative stitching to the vest front. Because the microfleece has some thickness, this will give a slight quilted effect to the vest. The stitching I added to mine is shown above; I simply marked out the lines with a ruler and then topstitched them. 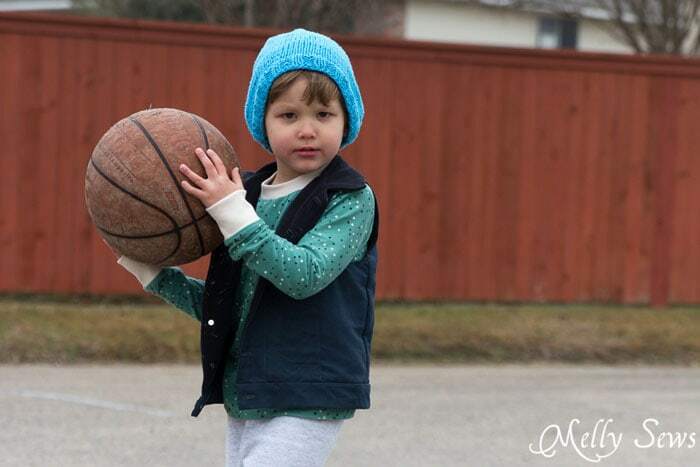 And deck out your little punk! My son will love this! Thank you so much!! I love sneaky mom for the win! My daughter who is 6 pulls the same thing all the time. I let her help me pick it all out and then she says, “no, I don’t like it”. Argh! But I love the vest. I may have to make it. My boys are less picky and will pretty much wear something if it’s soft and clean. It’s the girls I have to worry about. Great job!! 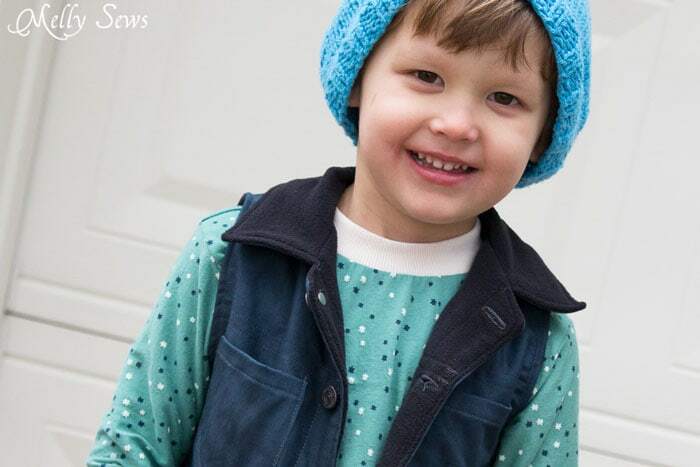 Great story, and I’m glad it had a happy ending. The added quilted details look really sharp. Hilarious story! Love it. And thanks for another free pattern for boys! It’s all in the framing. The other night I told my daughter, who was taking a bath, that it was time to “make her hair curly.” “Oh, but you’re not going to wash it, right?” “…I’m going to make it curly.” And she very obediently presented me with the back of her head, closed her eyes, and leaned back. Less than a minute later, her hair was curly (and clean). It took about 1/1000th of the time it normally takes to wash her hair. Hysterical. This is exactly the argument I would have with my 4-year old. And exactly the way I would handle it…after trying to “reason” with him. The vest is great! 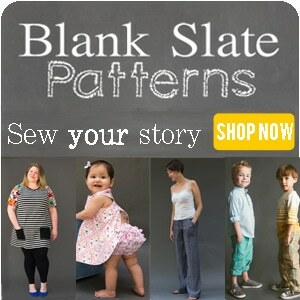 Thanks for sharing the pattern with us! 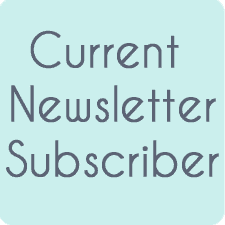 Thank goodness for Pinterest because I was not a subscriber back in March, and I didn’t see this one! I have a 6 yo punk and a pretty great 10 yo that totally need a couple of these this fall. I’m busily sewing fall skirts for my girls, but I never have anything to sew for the boys besides pjs. Thank you for this!